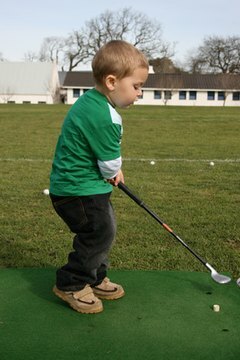 Kids can start golfing at an early age. Children often want to take up golf because they see how much fun their parents have with the game and they want to be a part of it. Because of its sometimes leisurely pace, golf provides a wonderful bonding experience for parents and children. However, it’s important to let the child decide how involved she wants to be in golf rather than pushing her. Very young children should use junior clubs, which are short and light. You don’t have to purchase a complete set right away. Pick out a 4-wood, a 5-iron, 9-iron and putter and let them learn with those until you notice them taking an active interest in the game. In his book, “My Golden Lessons,” Jack Nicklaus recommends that as a youngster grows and becomes stronger, have him use full-sized adult clubs as soon as he can handle them. This will help him develop the muscles needed for golf and learn swing fundamentals more quickly. One of the best ways to get a child involved in golf is to take her with you when you play. Let her observe and ask questions. You can begin teaching the basics of etiquette such as the player furthest from the hole hitting first, the importance of raking the sand trap and being quiet when another person is playing. Take her to the practice green on the driving range or the actual course when it is not crowded. Let her putt the ball from a short distance to get the thrill of sinking a putt. Make sure you reward successful putts with lavish praise. Learning the correct grip is vital for youngsters, but because their hands are small, getting comfortable with a grip is difficult. Show them how you grip the club by placing the left hand on the club, then the right. Point out the “V” formed by the thumb and index finger of each hand. To teach alignment, put a club on the ground aimed at the intended target line. Have your child line up his toes along this line so he gets a feel for the proper square position of his hips and feet. Young kids often stand too upright and too close to the ball. Demonstrate how to flex your knees and bend slightly forward. Children tend to hurry their swings in an effort to generate more power and hit the ball as far as mom or dad. With your own club, show him the one-piece takeaway--how you take the club back slowly and low to the ground rather than picking it up. Start a child off with easier clubs such as the 9-iron. Have the child take a half swing and focus on just making contact with the ball rather than worrying about how far the ball goes. Repeating these shorter swings helps the youngster learn proper balance so he is ready for full swings. How Do I Improve My Golf Swing for Free?